1. To ensure harmonious interaction with the natural environment. 2. To capture the beauty of a particular site including views, trees, natural features and slopes and incorporate them in the designs. 3. To manage and avoid negative impacts of building on the environment and adjoining properties. The design philosophy is to capture the serene atmosphere of the reserve and to ensure that nature, houses and people interact in a harmonious manner. The architectural language is based on simplicity by means of proportion, scale, form, colour and texture. The styles to be timeless and will not at all referred to any duplication of stylistic architecture. Natural elements and local building forms and materials will be enhanced. The inside/outside relationship has to be exploited. Layouts will be dictated by the features of each site and the privacy of neighbouring sites. Skylines, visibility and proportions will be regarded as important. Bold architectural statements will not be allowed but the emphasis must be on refined detailing and focus points. · Plans will be evaluated taking cognizance of the effect the building will have on the neighbouring properties and the macro impact on the surrounding landscape. · Visual privacy will be required to be incorporated in designs. · Outbuilding/yards to form part of the building complex. · A/C, pumps etc. must not be audible from adjoining properties. · Windows including placement and size will be scrutinized to ensure limited impact on neighbour’s privacy. · No landscaping other than landscaping will be allowed. Building forms. Larger building must be broken up into smaller well defined components. The size, proportion and placements of components must take cognizance of site and environmental conditions. Maximum permitted widths of buildings will be 8 meters. 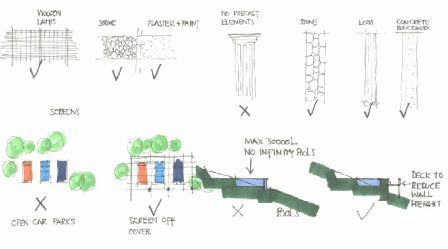 Plan forms can be organic or modular. Maximum building height of flat roof structure will be 6 meters and for pitched roofs 6 meters at the ridge. Mezzanine floors will only be allowed in flat roof designs. · Flat concrete roofs with crushed stone finish will be preferred. · Dark grey coloured roof sheeting at a maximum of 5 degrees will be accepted as an alternative. · Pitched roofs will be thatch or blue-gray slate tiles with a 45 degree slope. · No lean-to verandas will be allowed. · Overhangs can be large with a minimum of 900mm. Balconies are to be placed and designed so that privacy of neighbouring properties is not compromised. Balustrading can be low walls, wooded logs or frameless glass with stainless steel supports and has to conform to national building regulations. Supporting columns have to be simple and functional. No precast elements will be allowed. Wooden logs, exposed concrete finish or rock colours will be preferred. Timber logs are preferred although cantilevered concrete structures will also be accepted. Windows frames can be timber or epoxy coated aluminium. Sliding shutters are preferred for security. No external burglar bars will be accepted. To match windows. Can be painted or hardwood. · Red coloured travertine face bricks. · A combination of smooth and scratched plaster, painted. · Concrete with a rough finish or sand blasted. · Timber plank horizontal style cladding. Only earthy colours will be accepted in a palette from light to dark. Colours to be approved by the committee prior to commencing with final coats. Timber log type carports with netting and timber lath strips will be allowed. Garage doors to be timber, painted or hardwood. Screen for trailers to be provided for. No game vehicles will be allowed outside covered with canvas. No prefabricated wendy houses, tool sheds etc will be allowed. Lapa’s will be allowed only if the site permits it. Lapa’s to be screened off. Antennas and satellite dishes not to be higher than the roof lines and unobtrusive in position and colour. Solar panels to be flush with roofs and all pipes concealed and has to match the roof colour. All plumbing to be concealed. In general the design is to take cognizance of the slopes of sites. Excavations are to be confined to the footprint of the building or access to the property. All excavations to be treated by rock cladding or retaining structures not to exceed 2,10 meter in height. Final floor levels will be determined on site and no excavations or filling may be undertaken without final on-site approval. by walls or motors or wooden screens to form part of the main buildings. No pools larger than 30 000 litre will allowed. No infinity pools will be allowed. Pool motors to be placed in such a position that pollution is limited. All pools to be fitted with solid covers. Site lighting will be limited to the perimeter of the building and walkways between buildings. Only low area lighting will be required. No flood lighting will be allowed. * Styles to be timeless with no duplication of stylistic architecture. * The objective is to capture the beauty of a particular site including views, trees, natural features and slopes and incorporate them into the designs. * Natural elements and local building forms and materials will be enhanced. * Double story buildings will only be allowed with platforms if the fall of the land allows a lower floor.